"1.The episode is essentially an ironic riff on some Big Ideas put forth by Desmond's namesake, the Scottish philosopher David Hume. Those big ideas include a skeptical posture regarding the notions of interlocking cause-and-effect and seemingly miraculous phenomenon. 4. It would be a faulty leap in logic to assume that because Desmond's flashbacks were a form of time travel, then ALL flashbacks on Lost have been a form of time travel. ''I don't really see anything in the show to support that,'' says Lindelof. 5. Otherwise, the episode is open to interpretation." Clear as Mud, right? Basically, Lindelof said (and confirmed in the podcast) that we are to assume that Desmond actually EXPERIENCED his past again and did not imagine it. And that we should expect to see repercussions for his different decisions. Apparently, these are stepping stones to the ultimate "GAME CHANGER" that is planned later this season. Everything we thought we knew is going to be turned upside down and frustrate/excite fans even further! Can't wait! Let's see what we can dig up from this limited details episode! Okay, so we get more information on Jack's time in Phuket, Thailand. He referred to this during a game of poker with Sawyer last season. Yet, we saw no games of poker in this flashback. Instead we get to see him try to find himself for a month by having some fun with Achira (Don't know the spelling, but Bai Ling's character.). Jack is mystified by Bai Ling's (we'll just call her that) "gift." And just can't let it go. He learns how to fly a kite, is happy he doesn't have to deal with his Dad, and well...he becomes a stalker so he can get a tattoo. Exciting stuff isn't it? Let's break down the significance of the tattoo for a bit. Ever since season 1, references to Jack's tattoo have been made. Started as an inside joke between Kate and Jack where Jack wouldn't talk about it, season 2 Sawyer asks how he got it during the Poker game. The stupid thing is...it's actually Matthew Fox's real tattoo, and the producers have seemed determined to work this into the show. Well, they finally did. Congrats! I'm confused by Jack's motivation to be "MARKED" because Bai Ling claimed to be able to "SEE PEOPLE" for who they are and then mark them. We have learned over the seasons that Jack has quite a temper problem. I'm surprised he didn't go all Britney Spears and ask Bai Ling to shave his head also! Tom: "See this Glass house you're living in? Why don't I get you some stones?" oooooh Tom, chilling. Jack pours his soul to Tom about how he thinks the others are evil people, and this is the response we get? Patience is running thin amongst viewers on finding out WHY The Others consider themselves GOOD PEOPLE. We know we're going to find out this season. I'm guessing episode 11 (others-centric episode) will reveal some major stuff. We meet Isabel, some old lady referred to as the Sheriff. I think we can confirm that this is not the same old lady from Desmond's episode in the ring shop. Isabel apparently knows Chinese. And seeing her interrogate Jack and Juliet shows that the others have some sort of social structure all established. Juliet claims that their punishments are "Eye for an Eye" so her penalty for killing Pickett is death. Jack and Juliet's relationship advances throughout the episode as Jack finds out Juliet killed Pickett to save Jack's friends. She also did it with motivation to get home. You see Jack change his feelings for Juliet in stating to Isabel that he lied about Juliet wanting Ben dead. Ben might be paralyzed from the waist down. May never be able to walk again. Do we think that this will tie into Locke's paralysis and "miracle" on the island? Oh, I'm guessing that's a 90% certainty on that one. Can't wait for Locke's next flashback! How about seeing Cindy and the Kids again? Kinda sad when the girl Ana Lucia rescued asked how Ana was. Of course, then we remembered it was Ana Lucia, and weren't too sad! Cindy mentions that they are here to WATCH and that it's complicated. This naturally, makes Jack a raving lunatic and screams at everyone. A Caged animal indeed. End result? We didn't learn a damn thing! Oh right...and Juliet herself now got MARKED after Ben wrote his little letter to keep her alive. She has a nice brand on her back. 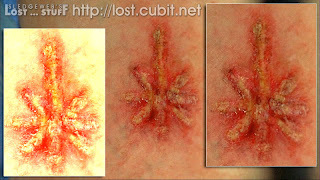 I guess this marks her as some kind of Outcast, similar to Jack's "Mark" signifies he was outcast from Thailand. Whether this symbol becomes more important down the road? We'll find out eventually! Okay, mainly this was a filler so that we don't GUESS on how they found their way back to the main castaways' camp. Time needs to advance in order to set up the next major storyline (THE RESCUE OF JACK). But there were necessary plot points that occurred here that were essential to make this happen. Kate and Sawyer pretty much find out that the others live on the same island. Pretty sure they'll put 2 and 2 together and realize that they'll move Jack there. Meanwhile, Locke still hasn't headed NORTH to rescue Kate, Sawyer and Jack. Perhaps NORTH is the location of Othersville? I thought North was where the FAKE CAMP was last season. But whatever! Sawyer is a little bitter that Kate seems preoccupied with Jack after their "Relations." But he's probably pretty spot on that their "RELATIONS" only really happened because she thought Sawyer was a dead man. Karl definitely was affected by that brainwashing film as he kept ranting off the messages from it. Or just the one "God Loves You as he Loved Jacob"
Karl reveals 2 things. What do they use the Hydra station for? To work on projects. (great! We kinda knew that!) Why did they take the kids? To give them a better life, better than yours. Again, referring to the GOOD PEOPLE vs BAD PEOPLE vibe. They want to get the kids while they're young and raise them to be GOOD PEOPLE also. Put into this that they recruited a fertility doctor and you get the theory that the OTHERS are all incapable of having children. Of course, it's all a theory at this point. Alex and Karl seem to be obsessed with Teddy Bears as they named a constellation Ursa Theodorus (which Karl suggests means Teddy Bear) And of course we got to see the infamous Teddy Bear from the tail section kids once again. 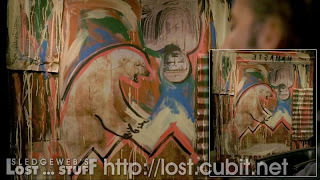 The last time we saw this bear was when Eko and Jin saw those crazy barefoot kids silently marching through the jungle. Yeah, I forgot about that until just now. We are still nowhere closer to finding out what THAT was all about! Anyway....Sawyer sends Karl off to be with his true love....pretty much sending him off to his death. Kate makes a good point that Karl could have led them to OTHERSVILLE. It's okay guys, you have John Locke! And to cap off this "setup" episode? We got our first Musical Montage episode of the season. Man, I missed these! I guess we've dispelled any formula suggesting that they did these every 4 episodes. Best thing about the Montage....we see Karl and Alex cheesily looking up at their Teddy Bear Constellation, Benry looking pathetic as he's boarded onto ANOTHER BOAT?? ?, and of course....I couldn't help getting a TITANIC VIBE between Jack and Juliet as they stood in the front of the boat with the music blaring. Well, in an episode with GRILLED CHEESE, may as well put as much cheese as you can get into the WHOLE episode! And yes, I'm including BAI LING! See you next week where we begin OPERATION RESCUE JACK! WOA!!! (yeah not just WOW this week, it's a WOA week!) Now that was one crazy episode! Where do we even begin talking about it? Well let's ease into it. Let's ask this question first. Is anyone still doubting the power of LOST? I'm sure there will be complainers that this episode dealt primarily with a season 2 addition and to top it off, it was mostly OFF the island (well...sorta!). But on the flipside, Desmond has been a fan favorite ever since we saw him riding his bike in the hatch to "Make Your Own Kind of Music." 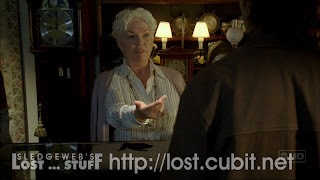 And his backstory seems to have some major relevance on the overarching mythology of LOST with Penny and Charles Widmore. Others may complain that we didn't see Jack or Kate and Sawyer.....well these were the same people complaining that we didn't see anyone else on back at the beach. I'd like to consider this the passing of time as Sawyer and Kate travel back to the beach, and time away from the OTHERS (while possibly meeting MORE others). 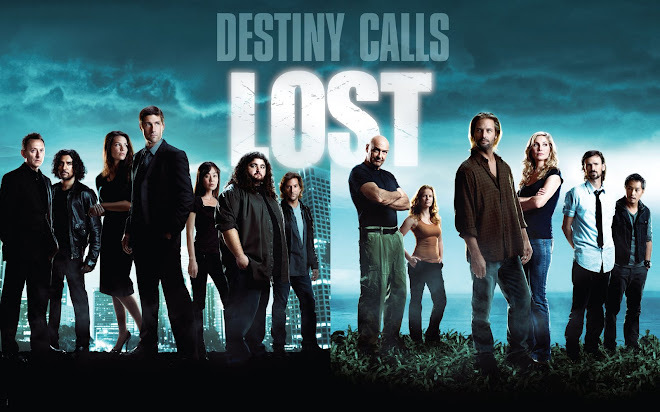 Of course, the non-stop season of LOST should help lessen the complaints, until we run out of episodes in May again! But me? I LOVED the episode! It totally blew me away mentally, but in a good way! The wheels are turning again folks! Okay, well last night was definitely an episode that requires discussion, so I expect all of your feedback after this one. Obviously, I haven't got it all figured out but I will share with you my thoughts as I was watching the episode, and discussions I had after the episode that made me see the episode in a whole different way. Basically, Desmond has another vision on the island and rescues Claire from drowning, meanwhile pushing Charlie aside at every change he gets. We are reminded of him knowing about Locke's Speech before it happened and about him knowing about the lightning that struck Clarie and Charlie's tent. Charlie and Hurley go on a mission to get Desmond drunk and ultimately get him to spill the beans on his new found skill of premonitions. From here on out we get what seems to be a flashback of when Desmond turned the key in the hatch. We are taken off of the island and into Desmond's Past. Another flashback episode....hmmm but there's a twist! Desmond feels like he's been there before and has brief flashes of another life (ON THE ISLAND!!! woaaaaa!!!). By the end of the episode Desmond tells Charlie that he saw his life flash before his eyes, how the flashes never stopped when he caught up to the present day, and that he has been trying to save CHARLIE from certain doom (the lightning struck him originally and Charlie originally drowned by trying to save Claire). Hints of Groundhog Day, Quantum Leap and Final Destination (AGAIN!!) ensue! Now let's discuss some theories of what happened! Then we'll get into some crazy easter eggs. Desmond never left the island. It's all in his head and someone is meddling with his mind - I just assumed that this is what was going on. Based on all of the crazy visions everyone has been having on the Island. There is clearly something messing with all of their heads. We've seen dead people come to life on the island, many of the survivors have had very vivid dreams or visions. But never have we seen someone that traveled back into his own flashback. So it might just explain more of the island's power....especially with the introduction to MITTELOS (LOST TIME) last week. Desmond turning the key ACTUALLY made him travel through time and get to relive his life. - I just don't know if I can get onboard with this one, but it does suggest some intriguing possibilities. If Desmond actually DID go back, did he return to the island once Jimmy knocked him out? Was this the universe course correcting itself because he was going to tell Penny how he really felt? Why wouldn't he just wake up after being knocked out and then go tell Penny? Why wouldn't everything play out until he got back to the island again? How would the island bring him back if he actually traveled through time? Or what if he DIDN'T return to the island at that exact point; and the producers are just saving room for more flashbacks? Could this lead to why Desmond told Jack "See you in another Life" at the stadium in Jack's season 2 flashback? Maybe Desmond had a future flash of Jack on the island before he even met him? Drives the mind a little nuts doesn't it? Time Travel will do that! It's a risky subject in the movies and on tv because there are so many chances to screw it up! But the dork in me (which is a lot of me) loves the possibility! Obviously Desmond is seeing flashes of the future for some reason. Is it because he already lived it? Or is it because someone/something or the island has already seen it? Or is someone causing these flashes to occur like the visions Locke, Eko and Charlie have seen? It might not even be the real future that Desmond is seeing, just what he THINKS the real future is. And maybe that is what's important for now. But what's up with the Old Lady in his "flashback?" She seemed to have a lot of knowledge on what DESMOND did do in his original past, and what his destiny is. Her purpose seemed to be to drill into Desmond's head that he can't change his or anyone else's destiny as the universe will course correct itself until it gets his way (Predestination, good times). Desmond's destiny is to save the world by pushing the button and then being forced to turn the safekey. She also implied that this is the "GREATEST THING he will ever accomplish" and that "WE ALL" will die if he doesn't push the button. So was that the entire world? or just "WE ALL" on the island? Desmond even refers to his subconscious and that she's really not there. Was she there in the original past? ARrrrgh my head is spinning! Anyway, the Old Lady had a very "ORACLE/Architect meets NEO in the MATRIX" type of discussion with Desmond. And she drilled into his head that he cannot change what he is destined to become. Just like she couldn't stop the man with the red shoes from dying (more on him in a second), Desmond cannot avoid is island destiny. So 2 weeks in a row we get the Final Destination shout outs. 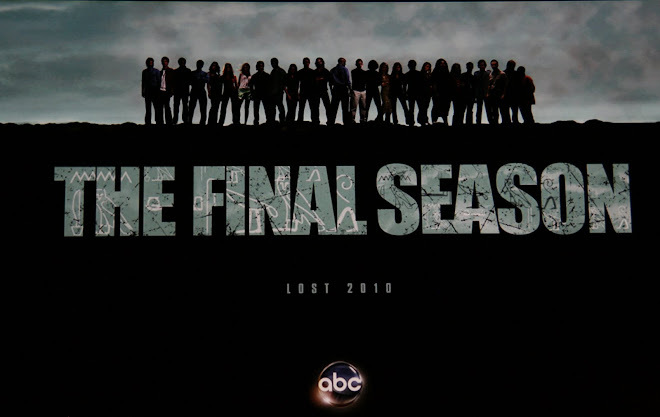 I really hope they aren't turning LOST into a lousy Teen Horror flick! Alright, I think it seems like I'm all over the place. It's probably because I am! Fantastic episode, but too many questions and too many possibilities to make any sense of it! We learned how the infamous picture of Penny and Desmond was taken. We all tried to guess where that picture was taken, and it was just a backdrop of a marina that they chose for a quick picture. Delivery man said "Delivery for 815"
Painting in Charles Widmore's office had Polar Bear, Buddha Statue (from the brainwashing film) and a message written semi-backwards (would be front ways in a mirror),"NAMASTE" (Dharma Guy loves saying it). From this can we conclude that Widmore is backing island activities? Or are we in a mirrored past that only RESEMBLES what Desmond actually went through? Old Lady points out Guy with Red Shoes - and then he gets smashed by a building....kinda like Dorothy's house came down on the Wicked Witch of the East and her red shoes. LOST loves its Wizard of Oz references. Apparently Kelvin wore the same Red Shoes as well. I can't confirm this right now. Heard it on the radio this morning. Charlie was in the "flashback" - does that mean he was there the first time too? He sang a clip from Oasis's "Wonderwall" conveniently the lyrics say "Maybe, you're gonna be the one that saves me" Nice foreshadowing! Also, Charlie's Middle name is Hieronymus. depict sin and human moral failings. "Make your own kind of music" plays 2 times in "flashback." This song will always remind you of Desmond any time you hear it, won't it? Any other relevance to them using the song again? Beats me. Hurley is found reading "Laughter in the Dark" by Vladimir Nabokov and John Banville. Okay, so what's the bottom line? Do we think Charlie is destined to die now? Does this upset anyone? I think it'll be pretty hard to get rid of his character at this juncture. There is still that storyline hanging out there of him abducting Sun, plus he's CHARLIE! He's Merry from Lord of the Rings! You can't just kill him! He is bloody DRIVESHAFT! That is why I believe this whole Desmond thing is all a manifestation in his head and that their future is not predestined. (Except that they were all destined to be on that island). Of course, we don't know WHEN said death of Charlie would occur. It could be next episode, it could be next year, it could be 50 years from now. Other bottom line? This Old Lady is probably a character we're going to get to know a bit better. Looks like we see her talking to Jack in next week's episode...ON THE ISLAND. Can it be a coincidence that Desmond had some kind of crazy vision with her in it too? Just a lot of uncertainties.....but this is when LOST works best. When people CARE about the confusion that the show causes! This episode stands up to some of the greatest from season 1 that simply just boggled the mind at the time. I'm going to keep racking my brain on this one and may come up with a totally new theory, but this is where I stand for now. Anyone else want to share their thoughts? Please do! I'm going crazy over here! I also apologize at the lateness of this blog, but I did give you advanced warning last week. This is probably a more realistic time to expect them in the future. Until you readers start coughing up some money, I'm going to have to put my day job first! Hope you enjoyed the read and see you next week! Welcome back LOSTIES! My my it has been too long, hasn't it? Well, I for one am glad that the show is back. I was starting to get to that point that I forgot what I was missing. Last night's episode erased that feeling from existence. And all I can say about the episode is...........WOW!!! Now, I can see where people may say it may not have lived up the hype that the episode received. But what was there not to like? There was suspense, action, more LOST mythology that will drive your mind crazy (well some people may not like that! ), and (for the first time since maybe last season) an engaging Flashback! And the best part is, we know that we're heading onward to 15 more episodes quickly, so there's no sense in getting too frustrated! And, we know we're heading back to the BEACH to revisit some of our favorite characters! For the most part, the captivity is over. Only poor self-sacrificing Jack remains with the others. Though I'm sure this will lead to even bigger reveals, and of course the big RESCUE mission being planned by non-compliant Kate (a la the previews for next week). 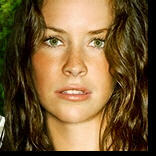 Okay, so Juliet was living in Miami and doing some experimental studies in the Fertility field. Her sister, Rachel, was a Guinea pig for her studies who apparently had issues with getting pregnant. (Or was it that she wanted to be impregnated without the assistance of a male counterpart?) So, we're not really sure what Rachel's illness was. Was she a cancer patient? Or did the side effects of the experimental drugs cause her to become fragile and very ill? Well, if we get another Juliet Flashback from even further back, we might eventually find out. 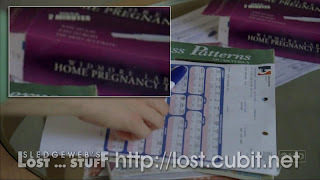 By The Way, Rachel's pregnancy test was another one from WIDMORE LABS (As in Charles Widmore and Penny Widmore and Good ol' Desmond!). Not sure if there's any way to tie this back to Sun yet, but there is a possibility that we may not know the father of Sun's unborn child yet (aka not Jin and not Baldy#2).....maybe SHE took part in some experimental drugs. It's a stretch, but with this show, even stretches are worth noting! Juliet's studies did not go unnoticed as her ex-husband wanted in on the profits and the mysterious Dr. Alpert (Not to be confused with the Office's Jim Halpert. Did anyone notice if this guy is Angelo from J.J. Abram's "What About Brian?) was trying to recruit her for studies in Portland. But when pressed, we found out that the experimentation was not being done in Portland but at some "off-site location." And just to confirm that we know it's the island, they put Ethan in Miami to help with the recruitment. So what is the significance of Dr. Alpert? Are we going to see him again? I'm guessing so. As for Ethan in Miami, this confirms that SOME people can get on and off the island (well that is they could until something we'll discuss in the Jack section) as long as they know how. Apparently Edmund Burke, Juliet's Ex-Husband, is the same name as an 18th Centry British Politician that was sympathetic to the American Revolution. Draw your own conclusions from that one. I'm LOST! Dr. Alpert shows Juliet a x-ray/ultrasound of a womb of what appears to be a 70 year old woman but it's confirmed that the woman is 26! Since this was 3 years ago, do we know any 29 year old females roaming around the island? Possibly Sun, but I figured she was older. Kate is around 26. Claire is probably a bit younger. Or it could be just some random woman. I'd say it's interesting enough to remember for future episodes though! Oceanic Plane was spotted landing in Miami. This obviously holds no significance and they just throw this type of stuff in to please fans. 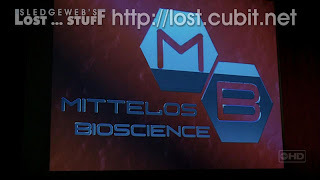 Mittelos is apparently an anagram for LOST TIME. What that means? Oh I dunno. But people, including myself, have theorized that somehow time is progressing more slowly on LOST Island than in the real world. I'm sure it's just some tongue and cheek phrase for the people "IN THE KNOW" of what's going on on LOST aka...the producers and apparently (confirmed on Kimmel Tuesday night) a few select Cast members. Stay tuned for 5 more years of LOST to figure out what this anagram means! And obviously the big reveal and mystery was Juliet suggesting that she could not leave for "Portland" because of her Ex-husband, jokingly suggesting that Alpert's organization could have him run over by a bus. And then, in a scene that looks like a homage to the movie FINAL DESTINATION, Burke was indeed run over by a bus. So this begs the question, can Juliet make things happen just by thinking about them (a la Walt) or did somehow the "COMPANY" arrange for this mysterious death to happen? I'm intrigued! Aren't you? Loved this exchange: Tom to Jack "I'm Tom by the way" Fantastic!!! Definitely seemed out of place. What's even funnier is continuing to see the devaluing of Tom's character. he started off as the BIG CHIEF of the others at the end of season 1, and now he just stands around looking unimportant most of the time! But he did feel important enough to let Jack know his real name! Ahh good times. Anyway, she showed that she could be ruthless in ordering the deaths of Kate and Sawyer if necessary. And even further by killing Danny (aka Pickett). Looks like she plays hard for whatever side benefits her the most at the time. Which reminds me, how can she be so ready to have Ben killed and then order him to be saved at the off-chance that Ben lets her go home? Seemed like there is a bit more to that muted conversation Ben and Juliet had together. (that's right, the AWAKE BEN with a hole cut open in his back. Nice work Jack!) And that's what Lost has created for us fans. DOUBT that anything is as it seems! While Juliet was helping to free Kate and Sawyer, Jack asks Tom why they didn't take Ben to facility off island. Tom began to say "Ever since the sky turned purple" and the Jack messed up in the surgery. So we're left thinking that the Hatch Blowing up has caused a problem with the others freely leaving the island. I'm not sure I'm buying it. They kidnapped Jack BEFORE the sky turned purple and KNEW he was a spinal surgeon! Of course, maybe Tom is just an idiot! Okay, so let's do some math folks. Juliet says she's been on the island for 3 years 2 months and 28 days. Last we heard from Ben, it's late November of 2004 (possibly December). Let's go with December. Subtract 3 years from 2004 and you're in 2001, 2 months and 28 days from December and you're in early September of 2001. This coincidentally is right near 9/11. What does this mean exactly? I have no idea. But there has been some crazy dude (I can't find his blog right now) that thinks that the entire mythology of LOST is based on the events that took place on 9/11 and the events that have taken place SINCE 9/11. Now, mind you, when I read his theory.....I found it completely comical (not that the tragedy of 9/11 was comical...but this guy's theory was ridiculous! I mean he was calling Jack or Locke George W. Bush!) But it is interesting to note how CLOSE to 9/11 that Juliet's timestamp gets us. Other tragedies such as Chernobyl have been referenced with the original Hatch too. I'd say just stay tuned on this one as well. For now, I'm thinking it's just a coincidence! So what's up for Jack next? Well, "They" have figure to figure out what to do with him. Who on earth is THEY? Ben and crew? Or a higher power? I LOVE QUESTIONS! So Kate and Sawyer have to get off the island, they recruit the help of Alex who recruits their help in rescuing Karl. Juliet kills Pickett, makes Alex stay. Kate, Sawyer and their new friend Karl leave for the vacation resort that we have come to know and love! But what crazy stuff did we see on their journey? I will admit that once Kate had the brilliant plan to get past Aldo and rescue Karl, I was instantly reminded of the infamous Han and Luke dressed as Stormtroopers holding Chewbacca prisoner in an attempt to rescue Princess Leia. I was almost ashamed of myself when Sawyer gave a shout out seconds later to the "Wookie Prisoner Gag" But I LOVED IT! So anyway, Princess Karl (errr just karl) was located in Room 23. Whoopie! More numbers! Notable images from the film. Hanso and Degroot make appearances. We see the name JACOB again and indeed has religious ties. We have yet to meet Jacob on the island (or so we think. He could be Eyepatch guy). - "Plant a Good Seed and you will joyfully gather fruit" - Planting Seeds, Fertility Doctors, Pregnancy tests.....this all has to lead somewhere right? - "Everything Changes" - Ok. Thanks for that one! - "We are the causes of our own suffering" - More Purgatory? Enough! - "God Loves you as he loved Jacob" - There's Jacob! - "Think about your life" -What about it? It all seems very Clockwork Orange'ish to me. But I don't really remember the movie too well. But I would guess that this scene, with the freaky music and the messages was an homage to the scene from that movie. What it all means? I'm as confused as you. But I love it! And of course, it was confirmed that Ben has a parental attachment to Alex. So, immediately we think of Rousseau (or as Hurley calls her "French Chick"). Is there some linking between Ben and Rousseau? Or when Alex was taken from her, did Ben become Alex's adoptive father? Did Rousseau know about Ben when she captured him in the net for Sayid? Or was this pre-arranged between Ben and Rousseau? So many ways they can go with this! And as a final bullet point, you have to love the touching scene when Kate told Jack the Nervous Surgeon story (that Jack had asked her to tell him). It just happened to be when Jack messed up in the surgery and he just may have been nervous again. Anyway, Kate's emotional retelling helped Jack complete the surgery. Sawyer looked on with a sense of sadness that Kate will never feel for him what she feels for Jack. But at the same time, seemed like he understood Kate's pain. Jack insisted Kate not come back for him, but we know her better than that! Wow, that's a lot to take in, isn't it? I'm sure not every episode will be this packed with details. I found myself pausing the TiVo every 30 seconds or less to capture stuff. And my friends, this is no way to enjoy one of the best shows on TV! So, don't be scared. I won't overload you with details in every blog. But, as I'm sure you can tell, I'm just excited that it's back! Hope you enjoyed the show and if you have any thoughts to share, please do! Next week and the 14 weeks following, the timing of the blog posting will probably vary. So don't get used to it being this early! See you next week! 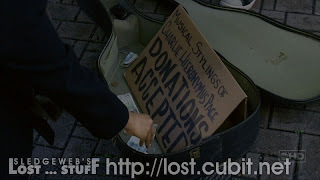 LOST: Need info before TONIGHT's winter premiere? Well, unfortunately, I'm putting all of my efforts into tomorrow's POST Episode Recap Blog to be of much assistance right now. But Entertainment Weekly (ew.com) went ahead and posted a nice pairing of articles today. 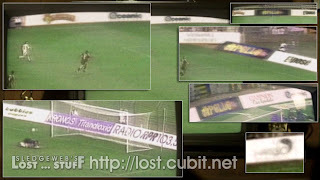 I know everyone may be losing the faith with LOST these days. No question this 13 week hiatus turned out to be a BAD idea. It will also be interesting to see how airing at 10pm on the East Coast will affect the show. I am reading very positive things about tonight's episode. Hopefully, they can get everyone back on board quickly. My blind faith in the show says they can! For you early sleepers out there, try to adjust your schedules to make sure you watch tonight, we have some discussing to do tomorrow!